Beginning April 18, children will need to be strapped into these types of seats until they are nine or stand more than 1.45 m (4’9”) tall. Under current Quebec guidelines, children need to use a car seat or booster seat until they’re taller than 63 centimetres while seated. Breaking the law in Quebec can result in a fine of up to $100 and three demerit points. Across the provinces and territories the age range varies. Some places in Canada have no specific rules around booster seats. The Child Passenger Safety Association of Canada (CPSAC), which provides training on how to install a car seat correctly, has compiled a list of the relevant legislation across the country. Ontario’s Ministry of Transportation requires children to use a rear-facing car seat until the child weighs at least 9 kg (20 lb.). 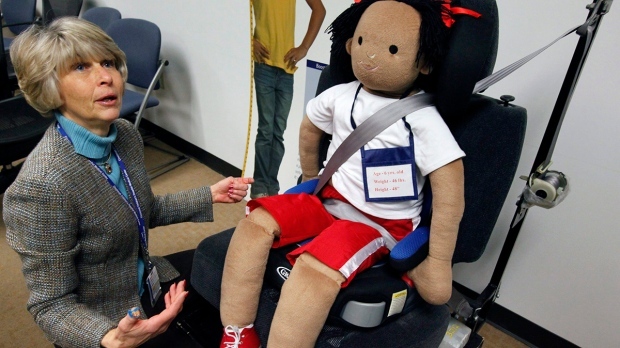 The province’s Highway Traffic Act allows children weighing 9 kg to 18 kg (20 to 40 lb) to use a forward-facing child car seat or a rear-facing car seat as long as the car seat manufacturer recommends its use. Booster seats are required for children weighing 18 kg to 36 kg (40 to 80 lb), stand less than 1.45 m (4’9”) tall and who are under the age of eight. British Columbia has a similar policy, with infants required to sit in rear-facing car seats until they are at least 12 months old and over 9 kg (20 lbs). They should continue to be buckled into this type of seat until they are 18 kg (40 lbs). Kids under the age of nine are required to be in booster seats with seatbelts or until they’ve grown to a height of 145 cm (4’9”) tall. According to Alberta’s Saferoads website (link), a child is safest staying rear-facing until they are at least two years of age or reaches the maximum weight or height limit of the rear-facing seat, as stated by the manufacturer. Once a child has outgrown the rear-facing seat they must be put in a forward-facing one until they weigh a minimum of 18 kg (40 lbs) or turn six years old. The next step is a booster or combination seat, of which there is no specific law. The Highway Traffic Act in Manitoba requires a car seat or booster seat suitable for the child’s age, weight and height. A booster seat must be used until the child is 145 cm (4’9”) tall, 36 kg (80 lb) or nine years old. The rules are the same in New Brunswick. In Nova Scotia, a child must be secured in a rear-facing seat until they are one year old and weigh 10 kg (22 lbs), according to the CPSAC. The child should be secured in a car seat until they weigh 18kg (40 lb). A booster seat should be used until they are 145 cm (4’9”) or nine years old. In Newfoundland and Labrador, children should be in rear-facing seats until they weigh a minimum of 9 kg (20 lb) and in a front-facing car seat until they weigh a minimum of 18 kg (40 lb). A booster seat must be used until nine years of age or until the child is 145 cm (4’9”) tall and weighs 37 kg (81.5 lb). On the island, children must be placed in a rear-facing seat until they’re one and weigh 10 kg (22 lb). A car seat should be used until the kid weighs a minimum of 18 kg (40 lb). A booster should be used until he or she is 145 cm (4’9”) tall, is 10 years old or exceeds the manufacturer’s weight limit. Saskatchewan rules state a child must use a car seat until they are a minimum of 18 kg (40 lb), but no rules on back-facing seats are given. The child must ride in a booster until they are seven years old or hit 36 kg (80 lb) and stand 145 cm (4’9”) tall. In the Yukon, children must be in rear-facing seats until they are a minimum of 10 kg (22 lb) and are able to walk unassisted. Legislation states that drivers must use a seat suitable for the child’s age, weight, and height until they weigh a minimum of 22 kg (48 lb). A booster seat should be used until the child is 145 cm (4’9”) tall or 45 kg (100 lb). A child must use a rear-facing seat until they weigh a minimum of 9 kg (20 lb) and after that, a car seat until they weigh a minimum of 18 kg (40 lb). Both have no legislation around booster seats. Using a booster seat helps keep your kids safe when you're on the road.